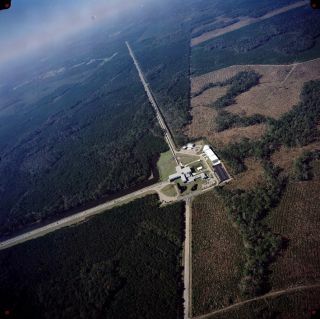 An aerial view of Laser Interferometer Gravitational-Wave Observatory's Livingston Laboratory. LIGO is a ground-based observatory that uses laser interferometry to seek out gravitational waves. Fleming Crim is assistant director for the NSF Directorate of Mathematical and Physical Sciences. Crim leads a staff of nearly 180 and oversees an annual budget of $1.3 billion, with the directorate supproting core research in astronomy, chemistry, physics, material science and mathematics. Crim contributed this article to Space.com's Expert Voices: Op-Ed & Insights. Late last month, I testified before the U.S. Congress alongside three leading physicists about a topic largely unknown on Capitol Hill: gravitational waves . After decades of effort, the LIGO Science Collaboration had directly observed these waves for the first time, and for representatives from both sides of the aisle, the enthusiasm was palpable. Insight into how the universe functions is one reward of fundamental research, and the hearing was an opportunity to thank Congress for their support — and to discuss the long, complicated path such discoveries follow. The history of the Laser Interferometer Gravitational Wave Observatory (LIGO) reflects determination, inspiration and tenacity: Although Einstein predicted gravitational waves a hundred years ago, their direct observation was a daunting — seemingly impossible — task. However, the possibility of opening a new window on the universe was so tantalizing that the NSF began funding research on prototype laser interferometers in the 1970s. In 1994, the agency committed almost $300 million to a group led by Kip Thorne and Ron Drever of Caltech and Rainer Weiss of MIT to transform their prototypes into a full-blown gravitational wave observatory. The research — driven by brilliance, vision, enthusiasm, experimental prowess and deep theoretical insights — persuaded the NSF, the National Science Board and Congress to take a risk. Even though the NSF had not funded anything on such a scale previously, the potential for transformative science justified such a big commitment. In starting this project, the agency embraced a new role by funding a large, high-risk, high-reward research platform. It was a new and daring bet on the future. Indeed, the path was a long one that required continuous learning and development of new technology to get the detectors to the necessary level of sensitivity. Whether the scientists were refining mirror coatings, fine-tuning analysis algorithms or ensuring vibration isolation, the process gradually advanced. And, in 2008, with continued unwavering commitment, the NSF went to Congress for the funds — $205 million — to build that next-generation tool: Advanced LIGO. It was this instrument that detected a gravitational wave last fall. It is easy, in retrospect, to see a simple, clear path to that breakthrough, but hindsight often simplifies the past. Those decisions were not simple or obvious or unanimous. Everyone involved took the sort of calculated risk that is inherent in exploring the unknown. The search we are now celebrating did not have to come out this way. The scientific community and the NSF were betting that the newly dedicated instrument would detect gravitational waves, but there would have been profound insights even if it had not. Because of the extraordinary sensitivity of the instrument, the absence of an observation would have constrained leading models of the universe, and our understanding of gravity. That said, it is much more exciting to observe gravitational waves, and winning the bet, open up a new era of observation. The NSF took the risk of supporting a major instrument that held the potential to transform our view of the universe. Such fortitude in funding the most ambitious science serves the nation particularly well. The gravitational wave discovery is a beginning, not an end. It marks the birth of gravitational wave astronomy, a new tool for understanding the cosmos. The really good news is that Advanced LIGO is designed to be three times more sensitive and should begin observations with even greater reach in the fall. And those observations are one element within the LIGO Scientific Collaboration, a group of more than 1,000 scientists at universities around the United States and in 15 countries. The United States has led this international collaboration, however, continued close cooperation with our international partners is key to taking the science to the next level. New observatories that our partners in Europe, Japan and India are developing promise an exciting future. With two detectors, it is only possible to localize the source of the signal to a large portion of the sky. With additional detectors, it will be possible to "triangulate" the source of gravitational waves and make other, more detailed observations. Basic research is uncertain and risky, but it's also revolutionary. LIGO is a striking example but not the only one. Fundamental science has transformed our world and will continue to change it in ways we have not yet imagined – in much the same way that Einstein's own theory of relativity is what ensures the accuracy of our GPS or that the same technique used to stabilize LIGO's sensitive laser frequencies also helps to build the semiconductors in our computers and cellphones. While all involved in the gravitational wave discovery can take enormous pride in this latest fundamental research accomplishment, now is not the time to rest. Now is the time to continue pushing back frontiers across all of science, to build on what we have learned, and open new windows on our universe.